Although Malcolm Vaughan was born into the Welsh mining community of Merthyr-Tydfil it was not the singing that the valleys were so famous for that first drew him into show business. Indeed, Malcolm had been quick to find work as a straight actor following his demobilisation from the army. He'd already had a little acting experience as a teenager, and had even appeared in minor roles on film. However, during 1954 he joined forces with Kenneth Earle becoming the straight man in half of a comedy duo for the Variety theatre. Gradually the singing took over and Malcolm became renowned for his clarity of diction and the strength of his tenor voice. Malcolm accumulated a long string of hit records starting in 1955 with "Ev'ry Day Of My Life". However, his most memorable hit came in 1957 with "My Special Angel". This recording, in common with his other later hits, had to compete alongside the growing number of rock'n' roll and teenage orientated discs as the 1950s drew to a close. Unlike some of his peers, Malcolm never quite managed to keep his chart career running into the 1960s, but drew consolation from continued stage work. The EP shown here (7EG8272) was Malcolm's first on that format. It contains material that was typical of Malcolm Vaughan's output during the early part of his recording career. Importantly for 45 collectors, it contains "Ev'ry Day Of My Life" -his first big hit- which was otherwise only available on 78 rpm. 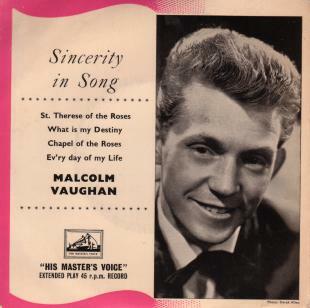 HMV 7EG8272 1957 "Sincerity In Song"
HMV 7EG8453 1959 "Sincerity In Song Vol.3"
HMV 7EG8542 (GES5785) 1960 "Hello Malcolm Vaughan No.1"
HMV 7EG8560 (GES5793) 1960 "Hello Malcolm Vaughan No.2" w. Frank Cardell Orch. HMV 7EG8579 (GES5799) 1960 "Request For Malcolm Vaughan"